Encouraging Good Habits With a Little Bit of Compromise | Real Girls F.A.R.T. Hi there! So I snapped this picture of some fresh veggies I prepared for my kiddos the other day. For those of you who have kids you know that when they come home from school they are insanely hungry. My kids like to fill up on “junk” mostly, which destroys their appetite for dinner’s “real food”. So I was left with the question of how I could get them to eat things that I didn’t care about them filling up on, yet making it very appealing to them because we all know we eat with our eyes first. 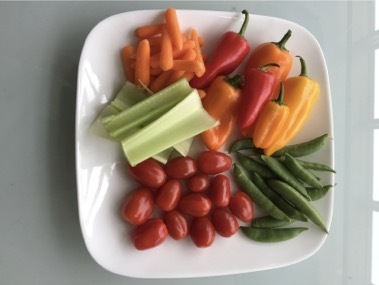 Recently, I was reading this article in a parenting magazine that gave me this brilliant idea…create your own veggie plate with all of the things your kids will eat and set it out on the counter for them to snack on at will. I, of course knew that I needed to tweak it a little in order for it to fly with my little bundles of joy. So, I had it all prepared for them when they came home and told them “you can have one snack from the snack drawer, but you can have as much of these veggies as you want”! Something about “have all you want” is magic to their little ears and so there it was I was happy and so were they! For all of you working moms who have a lot going on, I would say the best way to prepare the veggie plate would be to do it on Sunday night for the week or you could do a fresh plate every couple of days. Have fun with this. I would even encourage you to enlist the help of your kiddos so they will be even more inclined to eat the veggies. Try new things in with the usuals and see if they bite(no pun intended). Feel free to add ranch, cream cheese, peanut butter, or hummus. We gotta keep it positive for the ladies out there. There’s a lot of pressure. I’m coming to your house for my afternoon snack! You are always welcome love!!! This is a great idea! I have the same dilemma with my girls after school. I know my middle child will like this option because she loves fruits and vegetables. Thanks. I have the same problem with my daughter. Its amazi,chow famished She is when she comes home from school. I am going to try this with fruit as well. Just maybe I can get her to start liking more veggies.Thank you for sharing.